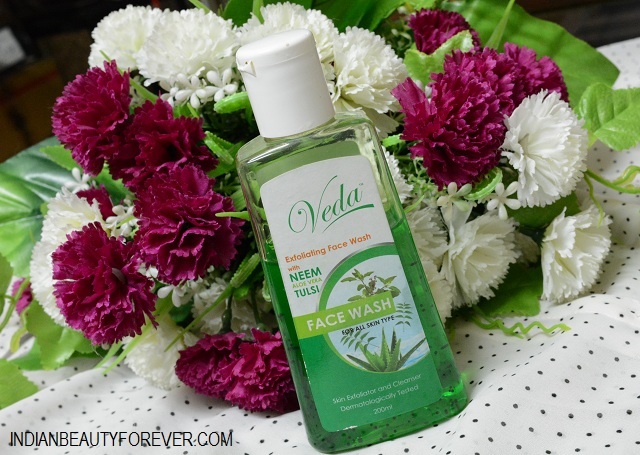 I will review a new face wash which is from this brand Veda which is enriched with neem, Tulsi and aloe vera. Neem is one of my favorite ingredients that is good for the acne prone skin. Neem is anti bacterial and anti septic which is good for the skin that tends to break out frequently. 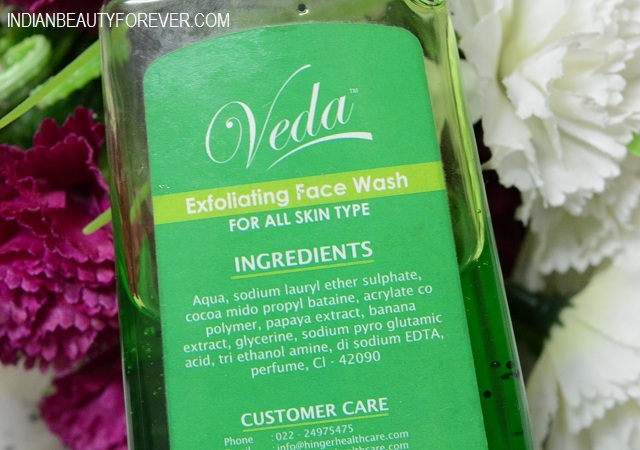 This is an exfoliating face wash from the same brand Veda, whose body lotion I reviewed recently. By far, the brand was impressive for the price paid. Not only for me but my mum had the same thoughts and my younger brother who’s using this face wash and loved it. So, read on dearies to know why, me and my brother loved this facial cleanser. Ingredients: As mentioned on the packaging. Refer the image below. 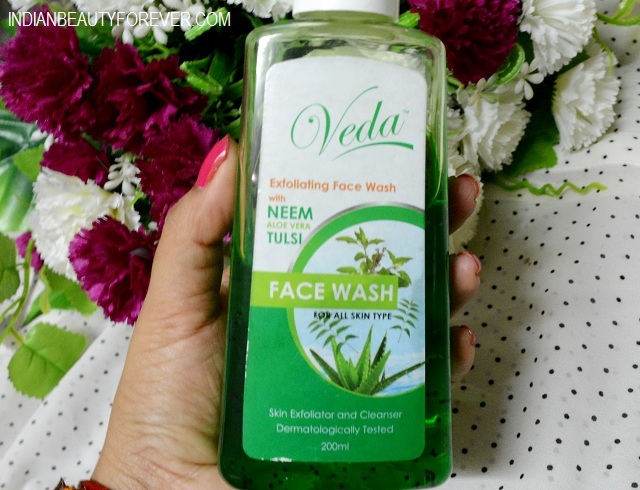 This Veda face wash comes in a sqarish plastic bottle with a flip top cap. I don't have any problem with the packaging as such but it’s just that the bottle that is slightly hard and the face wash is thick so this won’t come down in the palm easily. As I said the face wash is thick and has tiny green beads. This lather very well and cleanses the skin gently. My brother and me have acne prone oily-combination skin hence we both generally use the same face wash. Even if I use a different one, he will leave the one that he is supposed to use and quietly start using the one that I use, yeah he does that. Funny guy!! So, this face wash is really good for acne prone skin. This is what my brother claims since he had some tiny pimples on his cheeks and chin before my wedding and this has cleared them all. Even I used this for around 2-3 weeks prior to my wedding as I didn’t want any breakouts so was using this till the time I was at my mum’s place. The faint neem or herbal scent of the face wash is quite refreshing. The best thing is that just a tiny drop is sufficient for the wash. You don’t need a pea size or a coin size just a drop is enough. The only thing which isn’t a drawback or something but I couldn’t get it. It says that it is exfoliating face wash but there were no exfoliating particles. Availability can also be a problem but anyways, I would love to get this for me and my brother again as the price is really good for 120 rupees, there is 200 ml product which will last really long since we need less amount for a single wash. I will recommend this face wash to the youngsters with oily combination and acne prone skin. This face wash sounds really nice and it is affordable too.